This example shows you how to make repeated HTTP requests using an Ethernet shield. This example uses DNS, by assigning the Ethernet client with a MAC address, IP address, and DNS address. It connects to http://www.arduino.cc/latest.txt. The content of the page is viewable in the Serial Monitor. The Ethernet shield allows you to connect a WIZNet Ethernet controller to the Arduino or Genuino boards via the SPI bus. It uses the ICSP header pins and pin 10 as chip select for the SPI connection to the Ethernet controller chip. Later models of the Ethernet shield also have an SD Card on board. Digital pin 4 is used to control the slave select pin on the SD card. 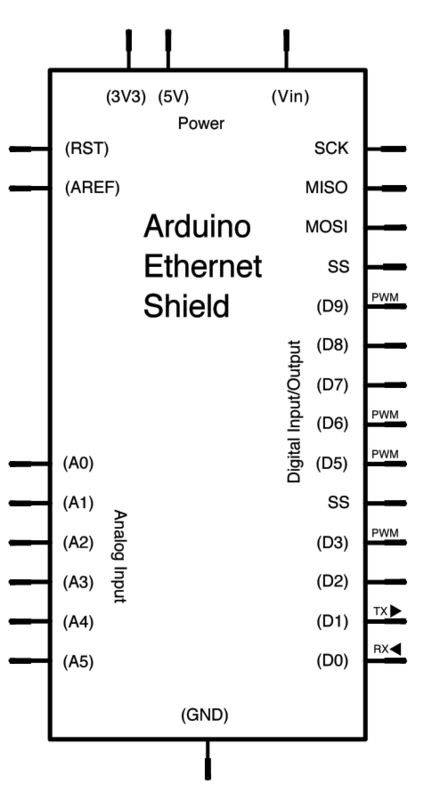 In the above image, the Arduino or Genuino board would be stacked below the Ethernet shield. IP address, and DNS address. 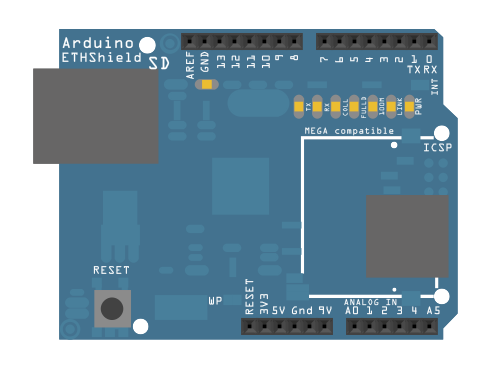 Arduino Ethernet Shield – Product description. Getting started with the Ethernet Shield – Get everything set up in minutes. Ethernet library – Your reference for the Ethernet Library. ChatServer - A simple server that distributes any incoming messages to all connected clients. WebServer - A simple web server that shows the value of the analog input. DhcpAddressPrinter – Get a DHCP address and print it on serial monitor. DhcpChatServer – Connect to a Telnet server and print on serial monitor all the received messages; uses DHCP. BarometricPressureWebServer – Post data read from a pressure sensor using SPI. UDPSendReceiveString - Send and receive text strings via the UDP protocol (Universal Datagram Packet). UdpNtpClient - query a Network Time Protocol (NTP) server and get the information through serial monitor.